Ability to prevent the formation of a smear layer during instrumentation or to dissolve the latter once it has formed. Systemically nontoxic when they come in contact with vital tissues, noncaustic to periodontal tissues, and with little potential to cause an anaphylactic reaction. 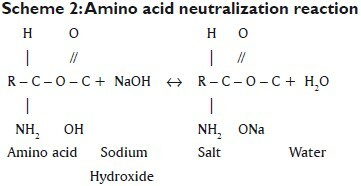 NaOCl neutralizes amino acids forming water and salt [Scheme 2]. With the exit of hydroxyl ions, there is a reduction of pH. The 'available' chlorine is the sum of the HOCl and OCl− concentrations in the solution. Available chlorine might be defined as a measurement of oxidizing capacity and is expressed in terms of the amount of elemental chlorine. HOCl is considered to be a stronger oxidant than the hypochlorite ion. The HOCl molecule is responsible for the strong chlorinating and oxidizing action on tissue and microorganisms. HOCl dissociation [Equation 2] depends on pH, with the clinical equilibrium between HOCl and OCl− being maintained as HOCl is consumed through its germicidal function. Baker  gave the relationship between HOCl, OCl− , and pH. At pH 10, basically all chlorine is in the OCl− form; the reverse occurs at a pH of 4.5, when all chlorine is in the form of HOCl. The disinfecting properties decrease with higher pH, paralleling the concentration of dissociated HOCl. Bloomfield and Miles  confirmed that hypochlorites at a lower pH possess greater antimicrobial activity. Andrews and Orton  reported that HOCl was responsible for the destruction of microorganisms. Morris  found that OCl− ion possesses approximately 1/80 th of the germicidal potency of HOCl in killing Escherechia coli. Busslinger and Barbakow  evaluated corrosion of endodontic files caused by NaOCl solutions of different concentrations from 0.5% to 5.5%. These authors concluded that the quantities of ions released by the corrosion process into the NaOCl solutions were insignificant. Consequently, no significant corrosion of NiTi files in these solutions was detected. Fabiola et al. suggests that exposure to 5.25% NaOCl solution affects neither resistance to flexural fatigue nor torsional resistance of NiTi K3 endodontic files. 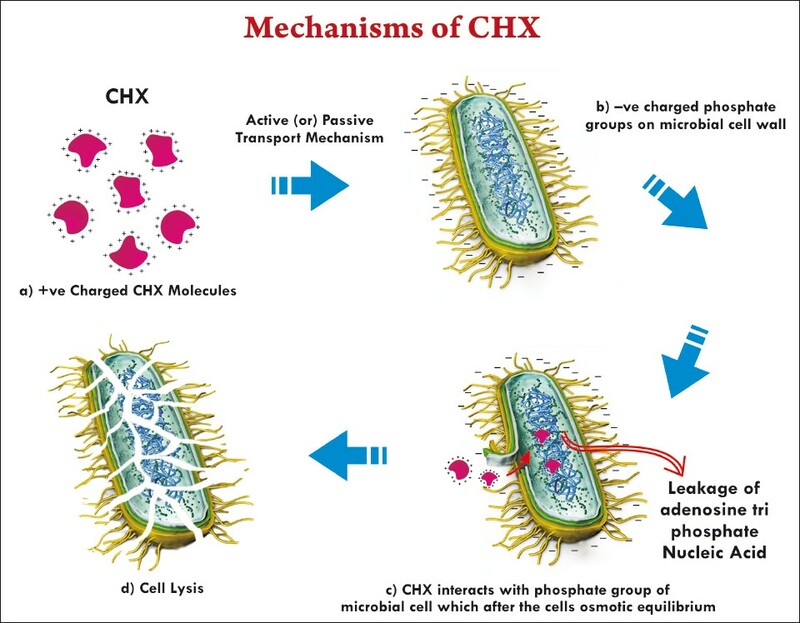 Figure 1: Mechanism of action of CHX. Human dentin contains at least collagenase (MMP-8), gelatinases MMP-2 and MMP-9, and enamelysin MMP-20. [66,67] Dentine collagenolytic  and gelatinolytic activities  can be suppressed by protease inhibitors, indicating that MMP inhibition could be beneficial in the preservation of hybrid layers. This was demonstrated in an In vivo study in which the application of CHX, known to have a broad-spectrum MMP-inhibitory effect,  significantly improved the integrity of the hybrid layer in a 6-month clinical trial. Auto-degradation of collagen matrices can occur in resin-infiltrated dentine but may be prevented by the application of a synthetic protease inhibitor such as CHX. On the whole, because of its broad-spectrum MMP-inhibitory effect, CHX can significantly improve the resin-dentine bond stability. Cytotoxic effects of CHX on canine embryonic fibroblast and Staphylococcus aureus showed that bactericidal concentrations were lethal to canine embryonic fibroblasts while non-cytotoxic concentrations allowed survival of bacteria. Ribeiro et al. evaluated the genotoxicity (potential damage to DNA) of formocresol, paramonochlorophenol, calcium hydroxide, and CHX against Chinese hamster ovary cells. Results showed that none of the mentioned agents contributed to DNA damage. Thus, in the clinically used concentrations, the biocompatibility of CHX is acceptable. The use of 10% citric acid as final irrigation has shown good results in smear layer removal. In vitro studies have shown their cytotoxicity, and 10% citric acid has proven to be more biocompatible than 17% EDTA-T and 17% EDTA. ,. A 3.8% w/v silver diamine fluoride (Ag[NH 3 ] 2 F) solution has been developed for intracanal irrigation. This represents a 1:10 dilution of the original 38% Ag(NH 3 ) 2 F solution used for root canal infection. The study on the antibacterial effect of 3.8% Ag(NH3 ) 2 F against a E faecalis biofilm model concluded that Ag(NH3 ) 2 F has potential for use as an antimicrobial root canal irrigant or interappointment medicament to reduce bacterial loads. E faecalis was completely killed by Ag(NH 3 ) 2 F after exposure to these agents for 60 min. The silver deposits were found to occlude tubular orifices after removal of the smear layer. Triclosan is a broad spectrum antimicrobial agent, active against gram-positive and gram-negative bacteria as well as some fungi and viruses. , Nudera et al. evaluated the minimum inhibitory concentrations (MIC) and minimum bactericidal concentrations (MBC) of triclosan and triclosan with Gantrez® against P intermedia, F nucleatum, A naeslundii, P gingivalis, and E faecalis. The MBC of triclosan ranged from 12-94 μg/ml. The MBC of triclosan with Gantrez® ranged from <0.3-10.4 μg/ml. The addition of Gantrez® enhanced the bactericidal activity of triclosan. Both triclosan and triclosan with Gantrez® demonstrated bactericidal activity against the five specific endodontic pathogens. Morinda citrifolia (MCJ) has a broad range of therapeutic effects, including antibacterial, antiviral, antifungal, antitumor, antihelmintic, analgesic, hypotensive, anti-inflammatory, and immune-enhancing effects. ,,, MCJ contains the antibacterial compounds L-asperuloside and alizarin  . Murray et al. proved that, as an intracanal irrigant to remove the smearlayer, the efficacy of 6% MJC was similar to that of 6% NaOCl in conjunction with EDTA. The use of MCJ as an irrigant might be advantageous because it is a biocompatible antioxidant  and not likely to cause severe injuries to patients as might occur through NaOCl accidents. During instrumentation canals should be irrigated using copious amounts of the NaOCl solution. Once the shaping procedure is completed, canals can be thoroughly rinsed using aqueous EDTA or citric acid. Generally each canal is rinsed for at least 1 min using 5 to 10 ml of the chelator irrigant. After the smear layer removal procedure, a final rinse with an antiseptic solution appears beneficial. Chlorhexidine appears to be the most promising agent for use as a final irrigant in this situation. It has an affinity for dental hard tissues and, once bound to a surface, it has prolonged antimicrobial activity, a phenomenon called substantivity. After the introduction of MTAD irrigant, newer irrigating regimen followed was initial rinse with 1.3 % NaOCl for 20 min and followed by final rinse with MTAD for 5 min. Future research on irrigants needs to focus on finding a single irrigant that has tissue dissolving capacity, smear layer removal property, and antibacterial efficacy. 1. Kakehashi S, Stanley HR, Fitzgerald RJ. The effects of surgical exposures of dental pulps in germ-free and conventional laboratory rats. Oral Surg Oral Med Oral Pathol 1965;20:340-9. 2. Baumgartner JC, Falkler WA. Bacteria in the apical 5 mm of infected root canals. J Endod 1991;17:380-3. 3. Sjogren U, Figdor D, Persson S, Sundqvist G. Influence of infection at the time of root filling on the outcome of endodontic treatment of teeth with apical periodontitis. Int Endod J 1997;30:297-306. 4. Baker NA, Eleazer PD, Averbach RE, Seltzer S. Scanning electron microscopic study of the efficacy of various irrigation solutions. J Endod 1975;4:127-35. 5. Zehnder M. Root Canal Irrigants. J Endod 2006;32:389-98. 6. Dakin HD. On the use of certain antiseptic substances in treatment of wounds. Br Med J 1915;2:318-20. 7. Pecora JD, Sousa-Neto MD, Estrela C. Soluηυes irrigadoras auxiliares do preparo do canal radicular. In: Estrela C, Figueiredo JA. editors. Endodontia - Princνpios biolσgicos e mecβnicos. Sγo Paulo: Artes Mιdicas; 1999. p. 552-69. 8. Spanσ JC, Barbin EL, Santos TC, Guimarγes LF, Pιcora JD. Solvent action of sodium hypochlorite on bovine pulp and physico-chemical properties of resulting liquid. Braz Dent J 2001;12:154-7. 9. Esterla C, Cyntia RA. Esterla, Barbin EL. 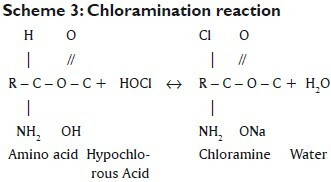 Mechanism of action of sodium hypochlorite. Braz Dent J 2002;13:113-7. 10. Siqueira J, Rocas I, Favieri A, Lima K. Chemomechanical reduction of the bacterial population in the root canal alter instrumentation and irrigation with 1 %, 2.5 %, and 5.25 % sodium hypoclorite. J Endod 2000;26:331-4. 11. Retamozo B, Shabahang S, Johnson N. Minimum contact time and concentration of sodium hypochlorite required to eliminate Enterococcus faecalis. J Endod 2010;36:520-3. 12. Martinho FC, Gomes BP. Quantification of endotoxins and cultivable bacteria in root canal infection before and after chemomechanical preparation with 2.5% sodium hypochlorite. J Endod 2008;34:268-72. 13. Bryce G, Donnell DO, Ready D. Contemporary root canal irrigants are able to disrupt and eradicate single- and dual-species biofilms. J Endod 2009;35:1243-8. 14. Harrison JW, Hand RE. The effect of dilution and organic matter on the antibacterial property of 5.25% sodium hypochlorite. J Endod 1981;7:128-32. 15. Hand RE, Smith ML, Harrison, JW. Analysis of the effect of dilution on the necrotic tissue dissolution property of sodium hypochlorite. J Endod 1978;2:60-4. 16. Abou-Rass M, Oblesby SW. The effects of temperature, concentration, and tissue type on the solvent ability of sodium hypochlorite. J Endod 1981;8:376-7. 17. Bloomfield SF, Miles G. The relationship between residual chlorine and disinfection capacity of sodium hypochlorite and sodium dichlorisocyanurate solutions in the presence of E. coli and milk. Microbios 1979;10:33-43. 18. Baker RJ. Types and significance of chlorine residuals. J Am Water Works Assoc 1959;51:1185-90. 19. Andrews FW, Orton KS. Disinfectant action of hypochlorous acid. Zentralbl Bakteriol Orig A 1904;35:645-51, 811-5. 20. Morris JC. Future of chlorination. J Am Water Works Assoc 1966;58:1475-82. 21. Dychdala GR. Chlorine and chlorine compounds. In: Block SS, editor. Disinfection, sterilization and preservation. Philadelphia: Lea and Febiger; 1991. p. 131-51. 22. Smith RM, Martell AE. Critical stability constants. New York: Plenum Press; 1976. 23. Frais S, Ng YL, Gulabivala K. Some factors affecting the concentration of available chlorine in commercial sources of sodium hypochlorite. Int Endod J 2001;34:206-15. 24. Bloomfield SF, Miles GA. The antibacterial properties of sodium dichloroisocyanurate and sodium hypochlorite formulations. J Appl Bacteriol 1979;46:65-73. 25. Sirtes G, Waltimo T, Schaetzle M, Zehnder M. The effects of temperature on sodium hypochlorite short-term stability, pulp dissolution capacity, and antimicrobial efficacy. J Endod 2005;31:669-71. 26. Paragliola R, Franco V, Fabiani C. Final Rinse Optimization: Influence of Different Agitation Protocols. J Endod 2010;36:282-5. 27. Jadaa AA, Paquι F, Attin T. Acoustic hypochlorite activation in simulated curved canals.J Endod 2009;35:1408-11. 28. Ishizuka T, Kataoka H, Yoshioka T, Suda H, Iwasaki N, Takahashi H, et al. Effect of NaOCl treatment on bonding to root canal dentin using a new evaluation method. Dent Mater J 2001;20:24-33. 29. Nikaido T, Takano Y, Sasafuchi Y, Burrow MF, Tagami J. Bond strengths to endodontically-treated teeth. Am J Dent 1999;12:177-80. 30. Busslinger BS, Barbakow F. Effects of sodium hypochlorite on nickel-titanium Lightspeed instruments. Int Endod J 1998;31:2904. 31. Barbosa FO, Gomes JA, Araϊjo MC. Influence of sodium hypochlorite on mechanical properties of k3 nickel-titanium rotary instruments. J Endod 2007;33:982-5. 32. Morris MD, Lee KW, Agee KA, Bouillaguet S, Pashley DH. Effect of sodium hypochlorite and RC prep on bond strengths pf resin cement on endodontic surfaces.J Endod 2001;27:753-7. 33. Ari H, Yasar E, Belli S. Effects of NaOCl on bond strengths of resin cements to root canal dentin. J Endod 2003;29:248-51. 34. Lai SC, Mak YF, Cheung GS, Osorio R, Toledano M, Carvalho RM, et al. Reversal of compromised bonding to oxidized etched dentin. J Dent Res 2001;80:1919-24. 35. Kuruvilla JR, Kamath MP. Antimicrobial activity of 2.5% sodium hypochlorite and 0.2% chlorhexidine gluconate separately and combined, as endodontic irrigants. J Endod 1998;24:472-6. 36. Basrani BR, Manek S, Sodhi RN, Fillery E, Manzur A. Interaction between sodium hypochlorite and chlorhexidine gluconate. J Endod 2007;33:966-9. 37. Chhabra RS, Huff JE, Haseman JK, Elwell MR, Peters AC. Carcinogenicity of p-chloroanaline in rats and mice. Food Chem Toxicol 1991;29:119-24. 38. International Agency for Research on Cancer: IARC Monography on the Evaluation of Carcinogenic Risks to Human. Vol. 86. Lyon, France: World Health Organisation; 2006. p.1-25. 39. Barbin LE, Saquy PC, Guedes DF, Sousa-Neto MD, Estrela C, Pιcora JD. Determination of para-chloroaniline and reactive oxygen species in chlorhexidine and chlorhexidine associated with calcium hydroxide. J Endod 2008;34:1508-14. 40. Shashikala K, Sudhakaran S. Evaluation and prevention of the precipitate formed on interaction between sodium hypochlorite and chlorhexidine. J Endod 2010;36:1154-7. 41. Bui TB, Baumgartner CJ, Mitchell CJ. Evaluation of the interaction between sodium hypochlorite and chlorhexidine gluconate and its effect on root dentin. J Endod 2008;34:181-5. 42. Von Der Fehr FR, Nygaard Φstby B. Effect of EDTAC and sulfuric acid on root canal dentine. Oral Surg Oral Med Oral Pathol 1963;16:199-205. 43. Mello I, Kammerer BA, Yoshimoto D. Influence of Final Rinse Technique on Ability of Ethylenediaminetetraacetic acid of removing smear layer. J Endod 2010;36:512-4. 44. Saito K, Webb TD, Imamura GM, Goodell GG. Effect of Shortened Irrigation Times with 17% Ethylene diamine tetra-acetic acid on smear layer removal after rotary canal instrumentation. J Endod 2008;34:1011-4. 45. Sudha R, Sukumaran VR, Ranganathan J, Bharadwaj N. Comparative evaluation of the effect of two different concentrations of EDTA at two different PH and time periods on root dentin. J cons dent 2006;9:36-42. 47. Kuah HG, Lui JN, Tseng PS, Chen NN. The Effect of EDTA with and without Ultrasonics on Removal of the Smear Layer. J Endod 2009;35:393-6. 48. Gu XH, Mao CY, Kern M. Effect of Different Irrigation on Smear Layer Removal after Post Space Preparation. J Endod 2009;35:583-6. 49. Mohammadi Z, Abbott PV. The properties and applications of chlorhexidine in endodontics. Int Endod J 2009;42:288-302. 50. Greenstein G, Berman C, Jaffin R. Chlorhexidine: An adjunct to periodontal therapy. J Periodontol 1986;57:370-6. 51. Athanassiadis B, Abbott PV, Walsh LJ. The use of calcium hydroxide, antibiotics and biocides as antimicrobial medicaments in endodontics. Aust Dent J 2007;52:S64-82. 52. Gomes BP, Souza SF, Ferraz CC, Teixeira FB, Zaia AA, Valdrighi L, et al. Effectiveness of 2% chlorhexidine gel and calcium hydroxide against Enterococcus faecalis in bovine root dentine In vitro. Int Endod J 2003a;36:267-75. 53. Gomes BP, Sato E, Ferraz CC, Teixeira FB, Zaia AA, Souza- Filho FJ. Evaluation of time required for recontamination of coronally sealed canals medicated with calcium hydroxide and chlorhexidine. Int Endod J 2003b;36:604-9. 54. Siqueira JF, Paiva SS, Rocas IN. Reduction in the cultivable bacterial populations in infected root canals by a chlorhexidine-based antimicrobial protocol. J Endod2007;33:541-7. 55. Basson NJ, Tait CM. Effectiveness of three root canal medicaments to eliminate Actinomyces israelii from infected dentinal tubules In vitro. SAD J 2001;56:499-501. 56. 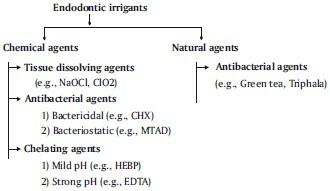 Oncag O, Hosgor M, Hilmioglu S, Zekioglu O, Eronat C, Burhanoglu D. Comparison of antibacterial and toxic effects of various root canal irrigants. Int Endod J 2003;36:423-32. 57. Gomes BP, Ferraz CC, Vianna ME, Berber VB, Teixeira FB, Souza-Filho FJ. In vitro antimicrobial activity of several concentrations of sodium hypochlorite and chlorhexidine gluconate in the elimination of Enterococcus faecalis. Int Endod J 2001;34:424-8. 58. Vianna ME, Gomes BP, Berber VB, Zaia AA, Ferraz CC, de Souza-Filho FJ. In vitro evaluation of the antimicrobial activity of chlorhexidine and sodium hypochlorite. Oral Surg Oral Med Oral Pathol Oral Radiol Endod 2004;97:79-84. 59. Sayin TC, Cehreli ZC, Deniz D, Akcay A, Tuncel B, Dagli F, et al. Time dependant decalcifying effects of endodontic irrigants with antibacterial properties. J Endod 2009;35:280-3. 60. Rasimick BJ, Nekich M, Hladek MM, Musikant BL, Deutsch AS. Interaction between chlorhexidine digluconate and EDTA. J Endod 2008;34:1521-3. 61. Spratt DA, Pratten J, Wilson M, Gulabivala K .An In vitro evaluation of the antimicrobial efficacy of irrigants on biofilms of root canal isolates. Int Endod J 2001;34:300-7. 62. Clegg MS, Vertucci FJ, Walker C, Belanger M, Britto LR. The effect of exposure to irrigant solutions on apical dentine biofilms In vitro. J Endod 2006;32:434-7. 63. White RR, Hays GL, Janer LR. Residual antimicrobial activity after canal irrigation with chlorhexidine. J Endodod 1997;23:229-31. 64. Khademi AA, Mohammadi Z, Havaee A. Evaluation of the antibacterial substantivity of several intra-canal agents. Aust Endod J 2006;32:112-5. 65. Rosenthal S, Spangberg L, Safavi KE. Chlorhexidine substantivity in root canal dentine. Oral Surg Oral Med Oral Pathol Oral Radiol Endod 2004;98:488-92. 66. Martin-De Las Heras S, Valenzuela A, Overall CM. The matrix metalloproteinase gelatinase A in human dentine. Arch Oral Biol 2000;45:757-65. 67. Sulkala M, Tervahartiala T, Sorsa T, Larmas M, Salo T, et al. Matrix metalloproteinase-8 (MMP-8) is the major collagenase in human dentin. Arch Oral Biol 2007;52:121-7. 68. Pashley DH, Tay FR, Yiu C, Hashimoto M, Breschi L, Carvalho RM, et al. Collagen degradation by host-derived enzymes during aging. J Dent Res 2004;83:216-21. 69. Gendron R, Grenier D, Sorsa T, Mayrand D. Inhibition of the activities of matrix metalloproteinases 2, 8, and 9 by chlorhexidine. Clin Diagn Lab Immunol 1999;6:437-9. 70. Hebling J, Pashley DH, Tjδderhane L, Tay FR. Chlorhexidine arrests subclinical degradation of dentin hybrid layers In vivo. J Dent Res 2005;84:741-6. 71. Carrilho MR, Geraldeli S, Tay F, de Goes MF, Carvalho RM, Tjδderhane L, et al. In vivo preservation of the hybrid layer by chlorhexidine. J Dent Res 2007b;86:529-33. 72. Sanchez IR, Nusbaum KE, Swaim SF, Hale AS, Henderson RA, McGuire JA. Chlorhexidine diacetate and povidone-iodine cytotoxicity to canine embryonic fibroblasts and Staphylococcus aureus. Vet Surg 1988;17:182-5. 73. Ribeiro DA, Scolastici C, Almeida PL, Marques PL, Marques ME, Salvadori MF. Genotoxicity of antimicrobial endodontic compounds by single cell gel (comet) assay in Chinese hamster ovary (CHO) cells. Oral Surg Oral Med Oral Pathol Oral Radiol Endod 2005;99:637-40. 74. Krautheim AB, German TH, Bircher AJ. Chlorhexidine anaphylaxis: Case report and review of the literature. Contact Dermatitis 2004;50:113-6. 75. Torabinejad M, Khademi AA, Babagoli J, Cho Y, Johnson WB, Bozhilov K, et al. A new solution for the removal of smear layer. J Endod 2003:29;170-5. 77. Haapasalo M, Qian W, Portenier I, Waltimo T. Effects of dentin on the antimicrobial properties of endodontic medicaments. J Endod 2007;33:917-25. 78. Dunavant TR, Regan JD, Glickmann GN, Solomon GS, Honeyman AL. Comparative evaluation of endodontic irrigants against Enterococcus faecalis biofilms. J Endod 2006;32:527-31. 79. Torabinejad M, Shabahang S, Aprecio R, Ketting JD. The antimicrobial effect of MTAD and NaOCl. J Endod 2003;29:576-9. 80. Torabinejad M, ChoY, Khademi AA, Bakland LK, Shabahang S. The effect of various concentrations of sodium hypochlorite on the ability of MTAD to remove the smear layer. J Endod 2003;29:233-9. 81. Hashem AA, Ghoneim AG, Lufty RA, Fouda MY. The effect of different irrigating solutions on bond strength of two root canal filling systems. J Endod 2009;35:537-40. 82. Gopikrishna V, Venkateshbabu N, Datta K, Kandaswamy D. Evaluation of the effect of MTAD in comparison with EDTA when employed as the final rinse on the shear bond strength of three endodontic sealers to dentine. Aust Endod J 2010. [In Press]. 84. Sceiza MF, Daniel RL, Santos EM, Jaeger MM. Cytotoxic effects of 10% citric acid and EDTA-T used as root canal irrigants: An In vitro Analysis. J Endod 2001;7:741-3. 85. Malheiros CF, Marques MM, Gavini G. In vitro evaluation of the cytotoxic effects of acid solutions used as canal irrigants. J Endod 2005;31:746-8. 86. Scelza MF, Pierro VS, Chagas MA, Silva LE, Scelza P. Evaluation of inflammatory response of EDTA, EDTA-T, and citric acid in animal model. J Endod 2010;36:515-9. 87. Moliz MT, Luque CM, Garcνa ME, Baca P. Enterococcus faecalis Biofilms eradication by root canal irrigants. J Endod 2009;35:711-4. 88. Wieczowski G, Davis EL, Joynt RB. Microleakage in various bonding agent composite resin systems. Oper Dent 1992;Suppl 5:62-7. 89. Ballal NV, Kandian S, Mala K, Bhat KS. Comparison of the efficacy of maleic acid and ethylenediaminetetraacetic acid in smear layer removal from instrumented human root canal: A Scanning Electron Microscopic Study. J Endod 2009;35:1573-6. 90. Zehnder M, Schmidlin P, Sener B, Waltimo T. Chelation in root canal therapy reconsidered. J Endod 2005;31:817-20. 91. Russell RG, Rogers MJ. Bisphosphonates: From the laboratory to the clinic and back again. Bone 1999;25:97-106. 92. De-Deus G, Zehnder M, Reis C, Fidel S, Fidel RA. Longitudinal co-site optical microscopy study on the chelating ability of etidronate and edta using a comparative single-tooth model. J Endod 2008;34:71-5. 93. De-Deus G, Namen F, Galan J, Zehnder M. Soft chelating irrigation protocol optimizes bonding quality of resilon/epiphany root fillings. J Endod 2008;34:703-5. 94. Cobankara FK, Ozkan HB, Terlemez A. Comparison of Organic Tissue Dissolution Capacities of Sodium Hypochlorite and Chlorine Dioxide. J Endod 2010;36:272-4. 95. Hua G, Reckhow DA. Comparison of disinfection byproduct formation from chlorine and alternative disinfectants. Water Res 2007;41:1667-78. 96. Lιvesque B, Ayotte P, Tardif R, Ferron L, Gingras S, Schlouch E, et al. Cancer risk associated with household exposure to chloroform. J Toxicol Environ Health A 2002;65:489-502. 97. Nishikiori R, Nomura Y, Sawajiri M, Masuki K, Hirata I, Okazaki M. Influence of chlorine dioxide on cell death and cell cycle of human gingival fibroblasts. J Dent 2008;36:993-8. 98. Eto JN, Niu W, Takeda FH, Kimura Y, Matsumoto K. Morphological and atomic analytical changes of root canal wall dentin after treatment with thirty-eight percent Ag(NH 3 ) 2 F solution and CO 2 laser. J Clin Laser Med Surg 1999;17:19-24. 99. Hiraishi N, Yiu CK, King NM, Tagami J, Tay FR. Antimicrobial Efficacy of 3.8% silver diamine fluoride and its effect on root dentin. J Endod 2010;36:1026-9. 100. Torabinejad M, Khademi AA, Babagoli J. A new solution for the removal of the smear layer. J Endod 2003;29:170-5. 101. Giardino L, Ambu E, Becce C, Rimondini L, Moora M. Surface tension comparison of four common root canal irrigants and two new irrigants containing antibiotic. J Endod 2006;32:1091-3. 102. Giardino L, Ambu E, Savoldi E, Rimondini R, Cassanelli C, Debbia EA. Comparative evaluation of antimicrobial efficacy of sodium hypochlorite, mtad, and tetraclean against Enterococcus faecalis biofilm. J Endod 2007;33:852-5. 103. McDonnell G, Russell AD. Antiseptics and disinfectants: Activity, action, and resistance. Clin Microbiol Rev 1999;12:147-79. 104. Zambon JJ, Reynolds HS, Dunford RG, Bonta CY. Effect of a triclosan/copolymer/ fluoride dentifrice on the oral microflora. Am J Dent 1990;3:S27-34. 105. Nudera WJ, Fayad MI, Johnson BR, Zhu M, Wenckus CS, BeGole EA, et al. Antimicrobial effect of triclosan and triclosan with gantrez on five common endodontic pathogens. J Endod 2007;33:1239-42. 106. Jagetia GC, Baliga MS, Malagi KJ, Kamath SM. The evaluation of the radioprotective effect of Triphala (an Ayurvedic rejuvenating drug) in the mice exposed to radiation. Phytomedicine 2002;9:99-108. 107. Prabhakar J, Senthilkumar M, Priya MS, Mahalakshmi K, Sehgal PK, Sukumaran VG. Evaluation of antimicrobial efficacy of herbal alternatives (Triphala and Green Tea Polyphenols), MTAD, and 5% sodium hypochlorite against Enterococcus faecalis Biofilm Formed on Tooth Substrate: An In vitro Study. J Endod 2010;36:83-6. 108. Hamilton-Miller JM. Anti-cariogenic properties of tea (Camellia sinensis). J Med Microbiol 2001;50:299-302. 109. Younos C, Rolland A, Fleurentin J, Lanhers MC, Misslin R, Mortier F. Analgesic and behavioural effects of Morinda citrifolia. Planta Med 1990;56:430-4. 110. Wang MY, Su C. Cancer preventive effect of Morinda citrifolia (Noni). Ann N Y Acad Sci 2001;952:161-8. 111. Li RW, Myers SP, Leach DN, Lin GD, Leach G. A cross-cultural study: Anti-inflammatory activity of Australian and Chinese plants. J Ethnopharmacol 2003;85:25-32. 112. Wang MY, West BJ, Jensen CJ, Nowicki D, Su C, Palu AK, et al. Morinda citrifolia (Noni): A literature review and recent advances in Noni research. Acta Pharmacol Sin 2002;23:1127-41. 113. Murray PE, Farber RM, Namerow KM, Kuttler S, Godoy FG. Evaluation of Morinda citrifolia as an endodontic irrigant. J Endod 2008;34:66-70.